Effective communication in the workplace. ﻿EFFECTIVE COMMUNICATION IN THE WORKPLACE Communication is one of the main aspects in a workplace, it is extremely important that the communication is effective that is taking place. Messages shouldn?t be transferred incorrectly and wrong messages shouldn?t be interpreted, this can cause many problems in the workplace. Different types of communication are needed in different situations, sometimes general communication may be used but however sometimes interpersonal communication can take place. Written communication skills are needed when communicating through writing, this can include emails and letters. 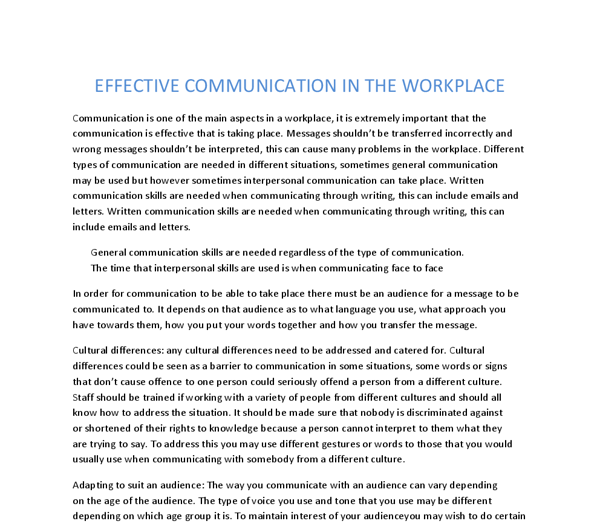 Written communication skills are needed when communicating through writing, this can include emails and letters. General communication skills are needed regardless of the type of communication. The time that interpersonal skills are used is when communicating face to face In order for communication to be able to take place there must be an audience for a message to be communicated to. ...read more. To address this you may use different gestures or words to those that you would usually use when communicating with somebody from a different culture. Adapting to suit an audience: The way you communicate with an audience can vary depending on the age of the audience. The type of voice you use and tone that you use may be different depending on which age group it is. To maintain interest of your audienceyou may wish to do certain things such as use a different tone of voice and different volume as well. You may raise your voice in order to keep interest from the audience and make sure that they can hear you, you could do things such as use a microphone to maintain the interest of the audience. ...read more. Other ways you can engage the audience are asking questions: If you ask questions to the audience it gives them a chance to get involved, also it will make them think about what you have said and gives them a chance to voice their opinion, an effective way of approaching question asking could be saying something along the lines of ?there will be a chance to ask questions at the end?, this will give the audience an incentive to listen to what you are saying even more. In the context of written communication a technique of engaging the audience and grabbing attention. For example in a presentation you may put animations, pictures and music in it to make it more enjoyable. You should only do this to a certain extent however, your audience may be distracted from the message you are trying to portray if they are overloaded with animations and pictures. http://managementhelp.org/blogs/communications/2011/01/02/20-great-ways-to-engage-and-involve-your-audience/ ...read more. Source Information * BBC bite size www.bbc.co.uk/schools/revision * Sam learning www.samlerning.com Bite size Is the study support resource for school-age students in UK. It is designed to support students in school and work, as well as exam practise for older students. Organisational skills - This will involve having a system or routine that helps an employee to complete their everyday tasks as efficiently as possible. An example would be organising one self's workstation. By making sure all apparatus is in place,this therefore helps the user interact quicker to have access to what is needed. The low-context cultures can be found in Switzerland, Germany, and North America including the United States (Jandt 2004:62). There are several key differences between these two types of cultures, among which the way a message transmitted is the most obvious one. Decision-making processes are based on strategies to guide the flow. Some common strategies include optimizing, satisficing, and incrementalism. 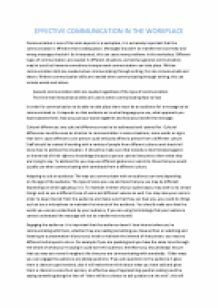 Decision support systems can help in any of the phases, in problem recognition and solution efforts, and in the implementation of various strategies. Industry standards - Ensuring communication standards are followed. An example of a protocol is when photographic film where new technology and every manufacturer labelled them using a speed number. Manufacturers created them for different use and labelled them with speed ratings of 50, 100 and 200 speed. The problem with this system was that each manufacturer determined what this speeds where.